So how did everyone's Christmas go? Was it relaxed? Madness? Still rolling along in eggnog fueled bliss? As you can probably tell from the lack of posting lately, I've not had a heck of a lot of time to myself. I need to get more organised again. I started off so well this year, but I've let it slip and now I have so many projects on the WIP and To Do lists that I'm starting to loose track of them. So a quick update on what has been happening. I have been getting photos back from some of the lovely ladies from the Going Dotty quilt I have been teaching. 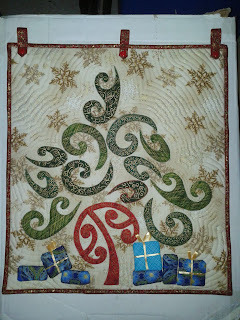 The first was from just before the course I took at QuiltWorks in Lower Hutt. Next is the first of my QuiltWorks ladies to finish. H was a heck of a lot of fun to teach! 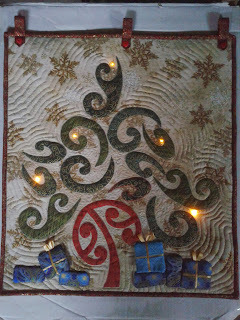 I am confirmed to rerun this course at Quiltworks in February - the start of the new school term. If you are interested, it will run on Monday nights for 4 weeks (7pm - 9pm). For more details, contact the lovely ladies in store. In other news, I will also be teaching this quilt as a single all day class through the Wellington Quilters Guild in March. That one will be a MUCH bigger class - woohoo! The shortest critic is now getting to an age where I can play dress-ups now. Busy little bee walking and running around, but still young enough that she will usually put up with what I put her in. She is already showing preferences though. Thankfully for me, she is drawn to bright colours not just girly pink. So it was well past time to make her a party dress. Well done Kelly. First item of clothing you choose to make in years and you pick something that has toddler sized armbands and 19 individual pieces! 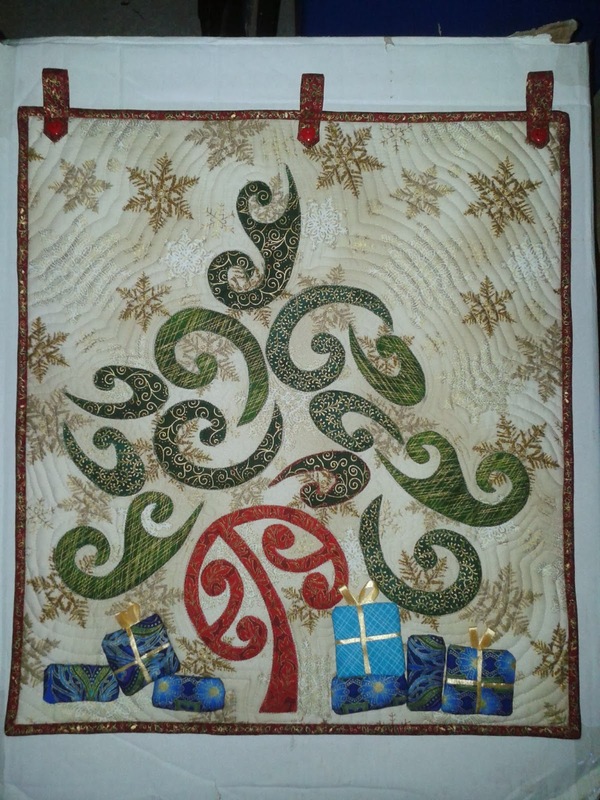 Have you seen the lovely modern Christmas tree wall hangings? The ones that have a highly stylised tree made of dots or swirls on a plain pale background? I love them. I wanted one, but I wanted one with a bit of a Kiwi flavour. So I made my own. This one is my first attempt. And yes, I am a geek. I finally found an excuse to play with electrically conductive thread! I took it with me to the December guild meeting and it caused a wee bit of a reaction during show and tell. It was reasonably well appreciated when it was held up for show and tell. I think that my modern without being stark style is quite liked by a number of the ladies. The 2nd version of this is almost finished now (I'll take it along to the January meeting). It has twice as many LEDs hidden inside the quilt and a pre-programed chip that makes groups of the LEDs randomly turn on and off so they look more like twinkle lights. The pattern for that one is going to be fun to write! I'll also have to import more parts in bulk so I can make some kits up. That one is a project for the new year though. I have two important projects on the machine at the moment that I can't go into just yet that have to be finished first. Big Congratulations for New Year honours!